Now that Ted Cruz and John Kasich have dropped out of the race, Donald Trump will almost certainly be the Republican nominee in the US presidential election. 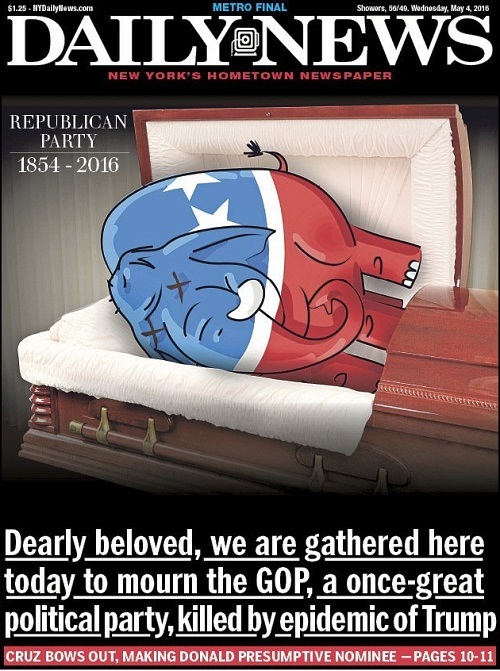 In response, the New York Daily News ran a cover bemoaning the death of the Republican Party. The real estate magnate has defied expectations at every turn. He has also shown a better understanding of the hopes and fears of blue-collar white males in America than any of his competitors. But winning a general election will be a much greater challenge. Unsurprisingly, a golf analogy works well for the pampered billionaire. 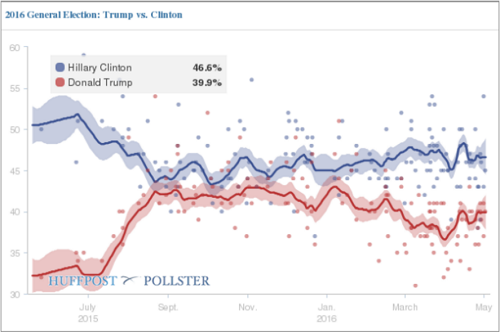 Trump has played an excellent short game, relying on populism and fearmongering to win the support of a large proportion of Republican voters. But he may have ended up in the bunker. Lashing out at Mexicans, berating Muslims and belittling women has worked so far, but he has alienated vast swathes of Americans and provided an easy route to the flag for Democrats. Demographics are likely to be Trump's undoing: white voters are predicted to make up 70 per cent or less of the electorate, a historic low. His message of aggression and antagonism may also lack impact, given the backdrop of a growing economy, falling unemployment and relative satisfaction with the current state of affairs. Trump has also given Hillary Clinton plenty of ammunition for attack ads, ranging from his casual misogyny and unrepentant racism to his lack of governing experience and history of business scams and misfires. Unless Trump can compel unprecedented numbers of white Americans to head to the polls, and also win over black, Latino and women voters, he will be out of luck. Slate has some excellent articles on the matter, explaining why Donald Trump won't win and pointing out that Hillary has maintained a substantial lead for some time. Our chart from The Huffington Post reinforces that fact. The last few NPR Politics podcasts have also outlined the challenges facing Trump. And journalist and statistician Nate Silver, who runs data blog FiveThirtyEight, recently pointed to the recent failings of the Republican Party and excessive media coverage as reasons for Trump's ascendance.